Chinese President Xi Jinping, right, and Taiwanese President Ma Ying-jeou, left, shake hands at the start of a historic meeting. The moment marks the first top-level contact between the formerly-bitter Cold War foes in 66 years. In a landmark moment, the presidents of China and Taiwan held an 80-second handshake ahead of a historic meeting in Singapore on Saturday. The handshake marked the first time that the two sides of the Chinese Civil War have come together since the Communists won the war in 1949, forcing the losing Nationalists to begin running their government from Taipei. 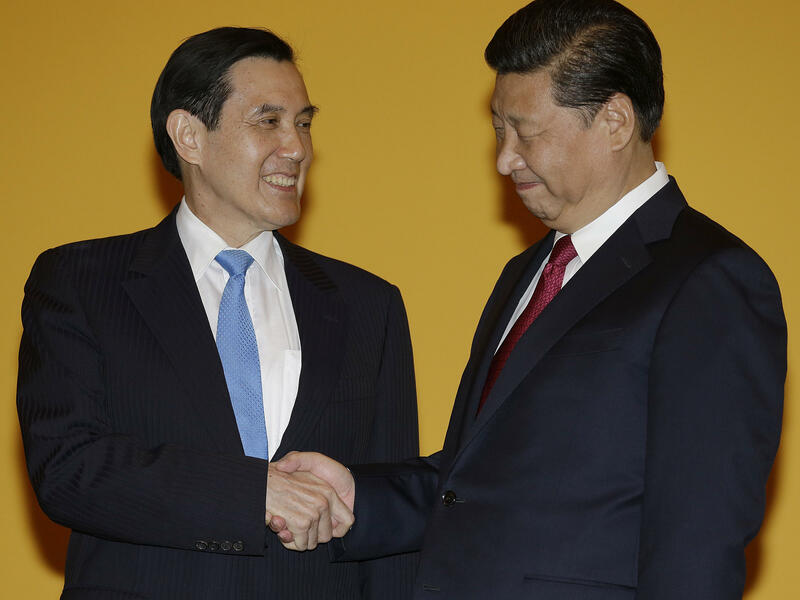 "History has left us with many problems which we need to deal with practically," Taiwan President Ma Ying-jeou said following the hour-long meeting with Chinese President Xi Jinping. The leaders both smiled broadly as they headed into their first direct talks since the end of the Chinese Civil War. Chinese President Xi Jinping said in his opening remarks that the two sides are "one family" that can't be pulled apart. President Ma Ying-jeou of Taiwan, a de facto state that Beijing considers a renegade province, said that each side should respect the other's values and way of life. Among outcomes of the meeting: China said it would welcome Taiwan joining its Asian Infrastructure Bank "with the appropriate title," as Beijing does not recognize Taiwan as a sovereign state. Ma told reporters Xi Jinping said he was willing to deal immediately with the idea of a cross-strait hotline, but that on problems Taiwan faces, such as joining international organizations like the World Health Organization, Xi said those issues would be dealt with "individually and in the future." All of this plays against the backdrop of domestic politics in Taiwan, where a presidential election is about two months away. Ma is a lame duck president with popularity ratings in the teens, and it's unclear how cross-strait ties will go if and/or when another party — which has favored Taiwanese independence in the past — takes the presidential office in January. "Let's plan and work together for the rebirth of the Chinese nation on both sides," said Zhang Zhijun, head of the mainland's Taiwan Affairs Office, in statement after the meeting. "We're very willing to keep talking and communicating." Following the meeting, the leaders are sharing a banquet dinner and splitting the cost. These landmark talks are the culmination of years of rapprochement under the leadership of Ma Ying-jeou and his Nationalist Kuomintang party. Both he and his party are losing popularity in Taiwan, where anti-Chinese sentiments have been growing. Friday night, the eve of the landmark meeting, a group of Taiwanese youth tried to break into the Legislative Yuan in Taipei to show their disapproval of the talks. The presidents of China and Taiwan met today for the first time in more than six decades. There were no huge formal agreements, but the meeting in Singapore certainly was a symbolic step for the rivals who fought each other during China's civil war. NPR's Frank Langfitt has been following events from Shanghai. Frank, thanks for being with us. FRANK LANGFITT, BYLINE: Yeah, good morning, Scott. SIMON: What happened? What did it look like? LANGFITT: It was a really interesting scene. You know, it began with this handshake between the Chinese president, Xi Jinping, and Taiwanese President Ma Ying-jeou. And they're both grinning on this stage. And they shake each other's hand for over a minute. And, obviously, this is designed to show goodwill between these old Cold War enemies, but it just kind of looks awkward to be shaking anybody's hand that long. And later, the men met in private, and they talked about setting up a hotline for emergencies. And then they reiterated this agreement from 1992 that both sides agree there's just one China, and Taiwan is part of China. But they kind of differ on what the interpretation of that is. And this has been a rhetorical way, for many years, just to keep the peace. SIMON: And, Frank, why go to the trouble, in front of the world, like this just to reiterate something that the two sides had agreed to more than a couple decades ago? LANGFITT: Well, I think you have to look at the timing and what's going on right now in Taiwanese politics. President Ma - he's about to step down soon, and he's been very unpopular, partly because he's been so close to the mainland. He's done a lot of trade deals, and some people in Taiwan feel like he's been selling them out to mainland China. His party - they're nationalists - they're expected to lose the presidency to the Democratic Progressive Party, which is much warier of China. And theirs, sort of, promote a more independent Taiwanese identity. So for President Xi, this is the last chance, maybe, to talk with someone he can really work with and also to send a message to the political opposition voters that he wants this concept that Taiwan is a part of China respected. And things can go pretty well if they stick with that and no inching towards independence, which is what is China's biggest fear. Now, there was a news conference after the meeting, and Zhang Zhijun - he runs China's Taiwan Affairs Office - he put it like this. ZHANG ZHIJUN: (Through interpreter) We are all of the same blood. We are all sons of the Yellow Emperor. We really should work together. SIMON: Frank, this might be a good day to remind ourselves of the deep and intricate history between these two Chinas. LANGFITT: Yeah, sure. If you go back to the civil war, 1949, China split. The communists won on the mainland, and China, of course, went communist. The nationalists fled to Taiwan, and over time, they eventually became democratic and a de facto independent country, even though China certainly doesn't see it that way. China still sees Taiwan as a province. And they've threatened, actually, to go to war to reunify. You got to remember, this isn't just a regional issue. The United States has been Taiwan's main protector. So if China were to attack unprovoked, possibly, the U.S. could be drawn into the fighting. SIMON: Taiwan's President Ma said he's been asking for this meeting for a long time. Why do you think China's president finally agreed? LANGFITT: Analysts say there're probably at least a couple of reasons. One is this is an opportunity for Xi Jinping to look like a peacemaker at a time where he has a lot of disputes with neighbors over the islands China's been building in the South China Sea. Also, the mainland had this policy towards Taiwan over the last eight years or so, doing lots of trade deals and trying to bring Taiwan into China's economic embrace. The fact of the matter is, it hasn't quite worked, haven't been able to win over Taiwanese hearts and minds. And a big reason for that is these people just have very different values. Taiwan is a democracy. It enjoys free speech. China is the most repressive it's been in many, many years. Many human rights lawyers have gone to jail, political activists. There's been a big tightening of control of the Internet. And the fact is, most Taiwanese - they just don't want to be a part of that China. SIMON: NPR's Frank Langfitt in Shanghai. Thanks so much, Frank.